Posted by TimTheFoolMan in car reviews. Getting in, the first thing I noticed was that this was clearly designed for American (large) backsides and (long) legs. With the seat pushed all the way back, I almost had too much legroom. That’s an odd experience for me. The next thing I noticed was the odd design. Now, to be certain, I can appreciate a little Andy Warhol every now and then. Even so, the sharp edges weird angles of the current Dodge lineup generally makes me nauseous. The Caliber lived up to that expectation perfectly. The external appearance made me wonder if the design team tried (unsuccessfully) to cast the car in Transformers: The Movie. I just couldn’t decide if the car was in mid-transformation at any given moment. This is not to say that the design is all bad. It’s weird, but not necessarily all bad. For example, as with most other Dodge products, there’s a wired input for your iPod (or whatever else is out there besides an iPod) or other audio device. I’ve started to carry a male-to-male 1/8″ stereo patch cable for just this type of situation, since FM converters are notorious for interference in strange cities where I don’t know which frequencies are used. Likewise, there are nice touches in interior lighting. As with many Dodge/Chrysler products these days, the cupholders are illuminated with little glowing rings. That might get annoying after I owned the car for awhile, but particularly in an unfamiliar rental, it was helpful. In the front seat, there was actually quite a bit of legroom. 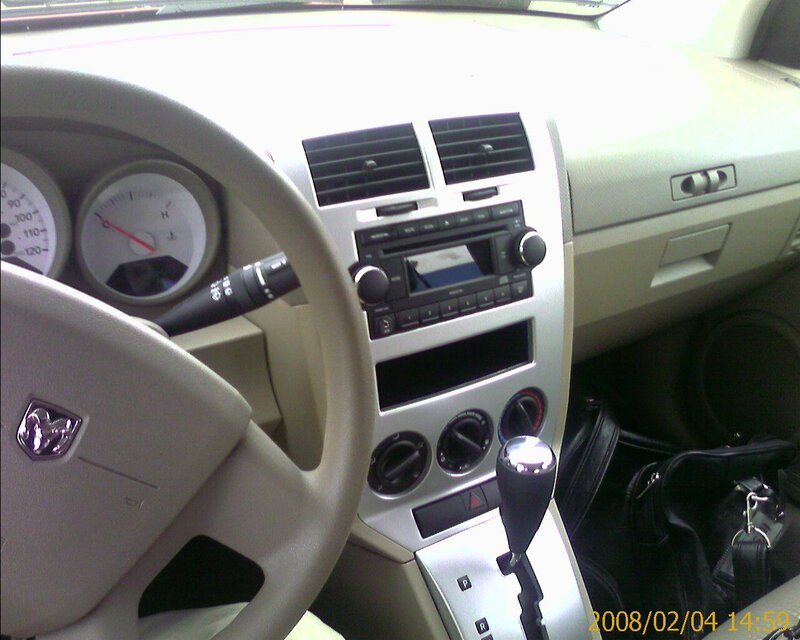 In many cars, the seating position becomes an odd geometric conflict between the position of the seat, the height of the steering wheel, and the (most likely) mislocation of the pedals. Other than the off-center wheel mentioned above, I was able to find a decent position fairly quickly. However, with my seat adjusted for comfort, the back seat immediately became a place for Johnny “No Legs” Smith from grade school. This is not to say that rear legroom disappeared completely. It did, however, drop down into the realm of painful contortion, should you make the relatively-common mistake of continuing to grow past 4 feet. Like many of the current cars in the Dodge lineup, the engine felt underpowered, and gave me the impression that it would tear itself apart if I pushed the engine too hard. At the same time, I averaged 25 mpg or so around town, so I suppose that was an economy compromise, and I shouldn’t expect too much. One fact of the rental car market that many people are unaware of is how car companies use such vehicles to silently market them. They set up complex deals with the rental companies to buy huge fleets of cars that they want to introduce to the public, suspecting that (like me) many people will drive one as a rental that they might never test drive at a dealership. Unfortunately, someone at Dodge did not have their thinking cap on when they created the build sheet for this particular car. It did not have power windows, power door locks, or any sort of way to adjust the mirrors without reaching out the window and pushing on the mirror itself. You may be asking yourself, “Self, why is TimTheFoolMan so bent out of shape about such minor annoyances?” I know how this feels, because other than not calling myself by my online moniker, I asked this particular question myself. I am an adult male with fully operational appendages. Why do I need or require such minor conveniences? Well, truth be told, I really didn’t get too bothered about the power windows. It was cold in Hartford, CT when I arrived, and stayed cold the whole time I was there. I didn’t go through a single drive-thru, so there was no reason for me to roll down or up the windows. Likewise, the mirror adjustment thing was… just weird, but once I had adjusted them, there was no reason to touch them again during this trip. Had there been another driver along, that might have changed things, but it really was a minor thing that made me curious why Dodge would even build such a vehicle in 2008. In contrast, the power lock thing just toasted my shorts. (Yes, I know that’s an unpleasant visual. Trust me, it’s even worse to experience it, but that would have to be the topic of another post.) Since my youngest son’s ’92 Honda Civic has non-power locks, I’m actually accustomed to reaching around and flipping down the locks manually in a small car. This car was similarly sized, allowing me to reach all the interior door locks with ease. Unfortunately, it’s a 5-door hatchback configuration. Why is that important? It means that the rear hatch also has a lock, and one that must be manually locked/unlocked. Even more unfortunately (for the poor sot who parks in worse neighborhoods than I did during my short trip), there’s no visible indication of the locked/unlocked status of the rear hatch. In sharp contrast to my son’s Civic, the Caliber has an external latch that allows you to open the hatch… when it’s unlocked. So imagine my surprise when I come back to the car after parking it all day with my iPod and laptop, apparently safely locked inside, only to discover that the rear hatch had been unlocked since I picked the car up, but there was no way for me to have known this. Fortunately, I parked in a public enough area that nobody was willing to draw attention to themselves by opening up the rear hatch and climbing over the seats, but if they had, I would be looking for a new iPod, a new laptop, and (depending on what documents were on the laptop) possibly a new job. Again I ask, why would a manufacturer equip a car this way? As a first car for a family on a tight budget (and relatively small children), the Caliber would probably work out reasonably well. It’s not a great car, but it allows Dodge to say that it has something with competitive specifications in this particular size category. Sadly, that’s about all they’ve done. I bought a Caliber and love driving it. I have two small children and couldn’t afford anything over 16,000, so it works for me. As for options, having no power locks is crazy!!! I got the dealership to foot the bill to have them put in. The windows do not bother me, but no cruise control has been hard to get use to. All in all, I wish i could’ve spent a little more money and got a better equipted car, but for now, it’ll do. Tim, have you ever rented a Geo Metro Convertible? Sorry for this poor american/sedish… but I think it´s redable. I have now had my Dodge Claiber in 7 months and will in a week have the second service. I´v driven it about 2500 kilometer under those 7 months. At the next service they will change the brake oil which I think is quite unnecessary, given the short time that I drove the car, I drive mostly on motorway. It has worked well and I am happy with it when I look at what it cost. What I am dissatisfied with is the gearbox. I will have to think in a completely different way and shift down much earlier than with other cars. I compare it to Saab and Volvo. It is much more plastics than the cars that I otherwise tend to drive, but despite this it is worth every dollar. The comfort is very comfortable but the view thrue the windows could have been a little better. What can be experienced as plastics becomes more evident when it closes a door a little too hard, there are not that heavy sound when the door closes. I hope that the Caliber will remain on the market and that FIAT want to keep the model, so I hope they look at the gearbox as I think it is really bad. Would I have bought a Caliber if I have known what I know today – yeas probably but If I was very rich? No that would have been out of the question. Thank you and excuse that it was late in my reply – better late than never. * Most of this was writen in Swedish and then translated at Google. Thanks for the review. My Car recently died and I find myself suddeny and unexpectedly needing to replace it. I am considering a 2008 Caliber SE for many of the reasons mentioned in the review more specifically; the price. Does anyone know if it is very expensive to have power locks and windos installed on this vehicle? I am thinking about get one as well. All I’ve heard is the appearance of the car what about the engine and reliablity? Pls help going to buy in a few days!! I bought one in October & so far it seems to be a good little car. Good zhandling, runs well, speed & acceleration is fine. Has some cute features for a basic car. I also found a place locally (Tampa/St. Pete area) that gave me an estimate of $800 to install automatic locks & windows. Not too bad in my opinion. I have not had it done yet because so far crankin a window by hand hasn’t bothered me too much. We have decided on a 2008 Dodge Caliber SE, but it does come with both power locks and windows. Apparently, many did not – but after hearing that many didn’t have them, we went back and revisited the car. 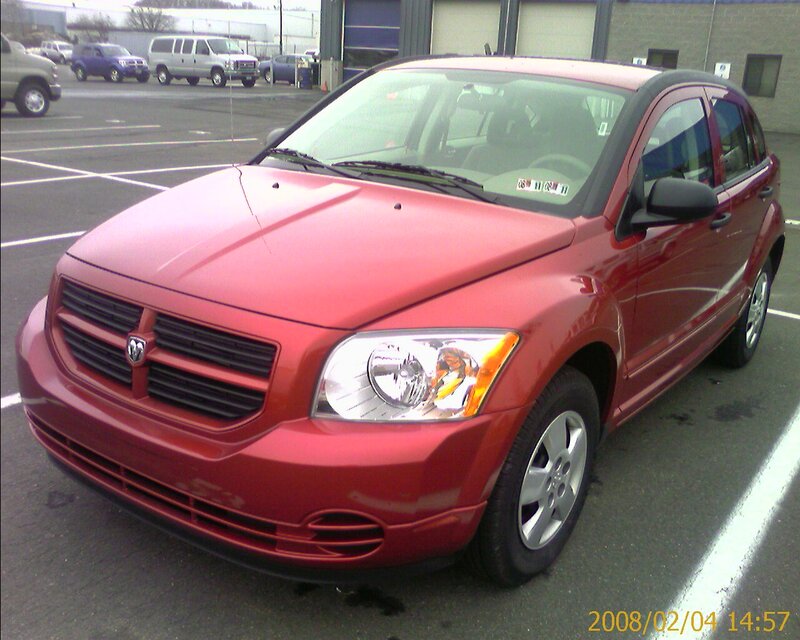 2008 Dodge Caliber…buyer beware !!!! We purchased this vehicle specifically as a third vehicle to do designated errands, etc and there are only 50,000 (pampered) kilometers on the odometer. JUST returned from our local Chrysler dealership from it’s scheduled oil change/tire rotation (I added a tune up/throttle body service as it has been running so badly of late..stalling and idiling very rough). Approx. an hour after the said vehicle was dropped off, came the dreaded call back from the service department stating that the brakes have basically no wear left (explains the high pitched,intermittant squeals), the right front strut is leaking oil,the right rear shock is leaking oil and the steering gear is leaking oil. Cost to repair these deficiencies is just over $2,500.00 !! Horrible road noise while on the highway,underpowered,you feel every bump (even the should be insignificant ones) coupled with a CHEAP and lacklustre interior (not to mention a resale value plummeting to almost nil). I have dispatched an e-mail to Chrysler Canada apprising them of this situation (convieniently,for Chrysler the warranty has JUST expired) and demanding they stand behind their “quality claim” and rectify this horrific situation !!! Anyways, great article! I really enjoyed reading it, especially since I can 100% relate to everything mentioned here. Have you driven an SRT-4 Caliber? I would be thrilled to read a review on that. Doris; if you ever make it through here again, I’m sorry but I cannot remember the name of the shop that gave me the quote to add the power windows and door locks but it is on Nebraska Ave just north of Busch BLVD on the East side of the street. I hate this car worse than death itself, which will probably come soon for me if I can’t get rid of this POS. I bought it new in 2009. Had to replace the transmission in February 2011. It just fell apart on the side of the road, showing the “transmission overheat” light (August 2013). You cannot work on the transmissions, you have to replace the whole crappy thing. When you step on the brakes, don’t hit a bump in the road or the brakes will release and fling the car forward. The gas mileage is worse than my 10-year-old Ford Ranger and a relative’s 2005 Mercury Grand Marquis, with none of the power or capabilities of those vehicles. In short, you’d be better off to get a mule and a cart. You can’t see crap out of the vehicle, can’t see the front end of the car nor the rear, which makes driving and parking a huge challenge, and the turn radius is something like my granddaddy’s 18-wheeler. Do yourself a favor and learn to skate. PS – leave it on the wrong side of town and pray that someone will steal it. Borrow money if you have to, pay off the piece and get out of it before it kills you. Oh, and the irony was that I traded in the antique Ranger for this bucket of crap under the “Cash for Clunkers” program, funded by the same government that bailed Dodge out – NOT a coincidence. Always remember and never forget, kids, that lesson we learned from the Trojan war – beware of Greeks bearing gifts (and that’s not a slam on Greeks).